Your skin and two different metals create a battery. When you place your hands on metal plates, you and the plates form a battery. Place both metal plates on a piece of wood or other nonmetallic surface. Using the clip leads, connect one plate to one of the multimeter’s test probes and connect the other plate to the other probe. At this point it doesn’t matter which plate attaches to which probe. Set the multimeter to measure current in milliamps. Place one hand on each plate. You should notice a reading on the meter. If the meter shows a negative current, reverse your connections, switching the probe connected to the copper plate with the one connected to the aluminum and vice versa. If the meter shows no current, check the connections and the wiring. If that doesn’t produce current, try cleaning the plates with steel wool to remove oxidation. Try pressing harder on the plates. Get your hands wet and try again. Switch the multimeter to measure voltage, and repeat the above experiments. Have one person put a hand on the copper plate and another person put a hand on the aluminum plate, and then have them join their free hands. Most batteries use two different materials and an electrolyte solution to create an imbalance of charge and thus a voltage. When the terminals of the battery are connected with a wire, this voltage produces a current. In this Snack, the thin film of sweat on your hands acts like an electrolyte solution and reacts with the copper and aluminum plates. When you touch the copper plate, a reaction happens that uses electrons. When you touch the aluminum plate, a reaction happens that releases electrons. This difference in charge between the two plates creates a flow of electrical charge, or electrical current. Because electrons can move freely through metals, the excess electrons on the aluminum plate flow through the meter on their way to the copper plate. In addition, negative electrons move through your body from the hand touching the copper to the hand touching the aluminum. As long as the reactions continue, the charges will continue to flow and the meter will show a small current. Your body resists the flow of current. Most of this resistance is in your skin. By wetting your skin you can decrease your resistance and increase the current through the meter. Since two people holding hands have more resistance than one person, the flow of current should be less. If you like, you can use the multimeter to measure resistance directly in these situations. You can use other pairs of different metals in a circuit to produce a current. The success you have using various metals will depend on a metal’s electrode potential, that is, its ability to gain or lose charges. Try various metals to see which produces the highest current reading. An electromotive series table shows the electrode potentials of metals and allows you to predict which metals will work well in making a hand battery. You can sometimes get a small current even between two plates made of the same metal. Each plate has a slightly different coating of oxides, salts, and oils on its surface. These coatings create slight differences in the surfaces of the metals, and these differences can produce an electrical current. The slightly painful sensation of a fork tine touching a metal filling, the process of plating metals, sacrificial anodes used to preserve ship hulls and iron bridges, potato clocks, and dielectric unions to prevent deterioration of copper and iron plumbing are all everyday examples of metals transferring charges. Construct a simple battery that can power a light. Light an LED with five cents. 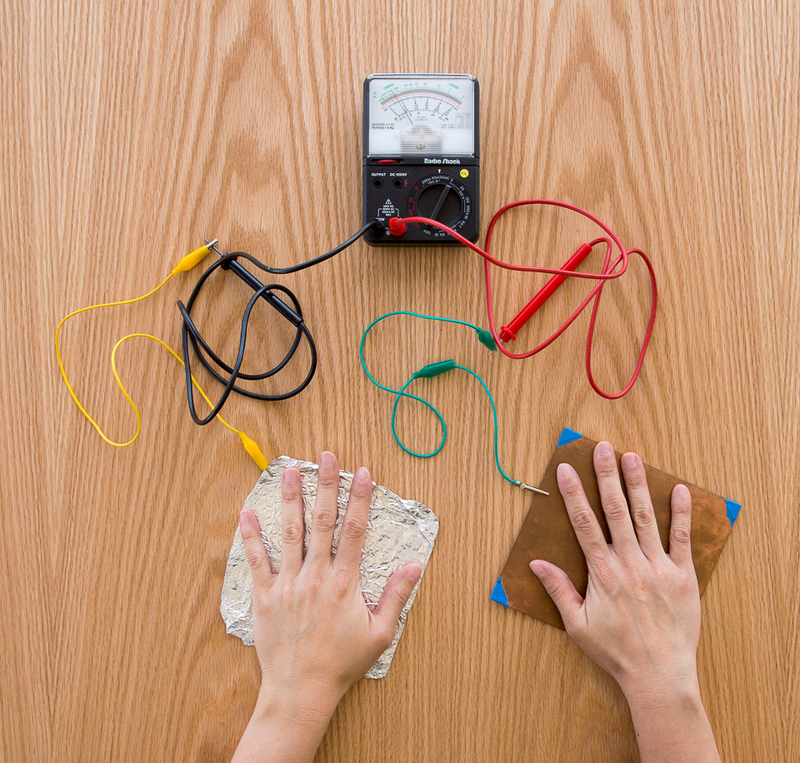 Make a conductivity meter and let your electrolytes shine.